I had one of my periodic lunches with Dave Winer, which — as always — was filled with insights into technology, the media and lots of amazing new tools for making sense of our world. We both are Berkeleyites of not quite five years standing, which makes us a bit more than newbies, but still well short of veterans. It’s an great city, thanks to the chemistry of a world-class university, the ideal climate, a long history of free-thinking, dissent and non-conformists, and the connection with San Francisco across the Bay and Silicon Valley just beyond. 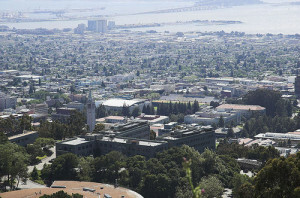 So where would you turn if you wanted to know everything about Berkeley? I don’t think there’s anywhere. The San Francisco Chronicle covers a much bigger patch, and it is in desperate shape commercially. We have two local papers, the Daily Planet and the Voice, but neither has really adapted to the web (although the Planet has improved its web presence in the last year). In any case, neither really satisfies my needs. The Planet works at being a good local paper, but it has a very definite political axe to grind (of course: it’s Berkeley). The Voice is the local arm of a bigger operation, the Contra Costa Times, and is pretty so-so. The university newspaper, The Daily Californian, is pretty good, but it understandably focuses on Cal, which isn’t all of Berkeley. There’s an amazing community gathered around the Berkeley Parents Network, but it’s not anything approaching a news source. So I think Berkeley provides a near-perfect test bed for a great hyperlocal site. Some of the elements might already be there. Home Girl (full disclosure: the creation of my wife) covers the real estate market and larger issues around the built environment in Berkeley. That could be a start. There is a staggering concentration of great bloggers and tweeters in Berkeley, even if many of them don’t concentrate on what’s happening on their home patch. Markos Moulitsas, the man behind Daily Kos, is a Berkeleyite. There’s Dave. Biz Stone, one of the Twitter founders, is in Berkeley. Econoblogger supreme Brad DeLong is here (even if he lives through the tunnel in Lafayette). Who knows how many great bloggers are here that I don’t know about? And there’s a great source of energy and ideas in the large student population. It’s become a cliché of our Great Recession that great ideas emerge from hardship. Perhaps this is an idea whose time has come? This entry was posted in Uncategorized on May 6, 2009 by lance. You won’t be surprised to hear that I too have been researching current news coverage of Berkeley and, as you say, there is little out there in terms of aggregated, online news. The same is not true of Oakland which has spawned several websites and blogs covering local news, including A Better Oakland and Living in the O. And both Montclair and Alameda have several dedicated community blogs/sites. You can add the East Bay Express to your list as well as the City of Berkeley email newsletters (which include regular consolidated news scans). Also, the UC Journalism School has a citizen journalism project called the 510 Report, run by Cynthia Gorney, with a Berkeley feed. I would kill for a Berkeley version of A Better Oakland. Kos: Is it the platform for activism that A Better Oakland provides that you’d kill for? What are the other elements that you’d like to see in a Berkeley version? AAfter.com search provides links to local news, discussions. Just try to search berkeley, ca or 94701. I’ve posted quite a bit about growing up in Berkeley in the 60’s… but I have a feeling that’s not what you’re looking for! Hmm. If you’re not interested in the “political axe”, what is so special about the city boundaries of “Berkeley”? North Oakland at Alcatraz and Shattuck is basically Berkeley. South Albany is basically Berkeley. Or to them, the nearby parts of Berkeley are basically Oakland, Albany, respectively. Culture doesn’t need city boundaries like our current political system does. Isn’t “The City of Berkeley” arbitrary for what you want? Would we be better served using a generic solution for finding local information? Semantic search?